Have you ever seen something in a store and really wanted it badly, but you weren’t willing to pay the price they were asking? Yeah, I guess we’ve all been there! 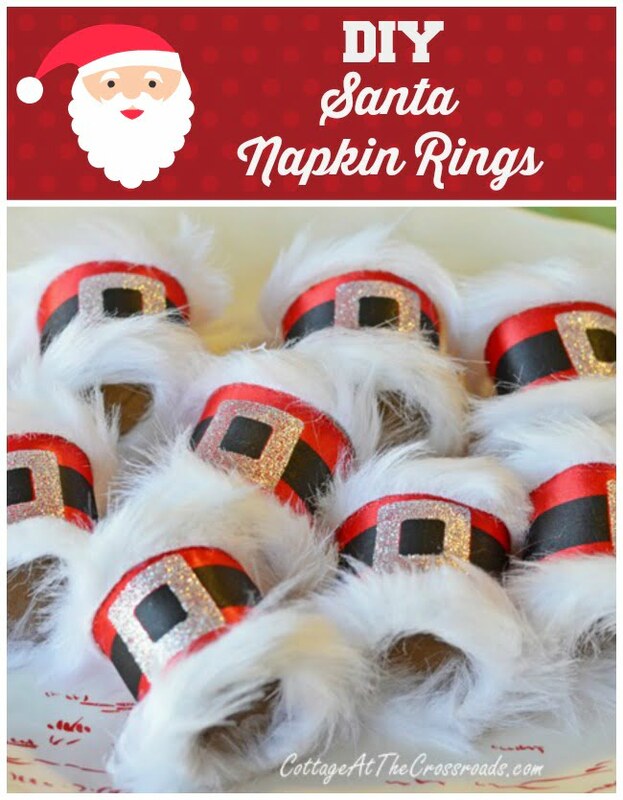 I saw some cute Santa napkin rings in a store and they were about $6 each. Since I needed 8, that would have been close to $50! Yikes, no way was I going to pay that! 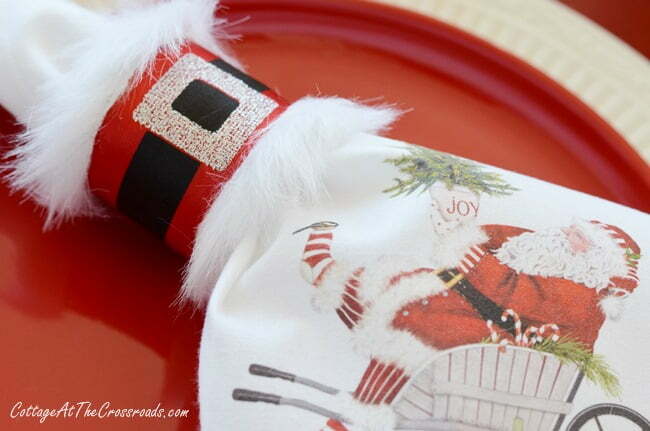 So I figured out a way to make these DIY Santa Napkin Rings for about $5 total! 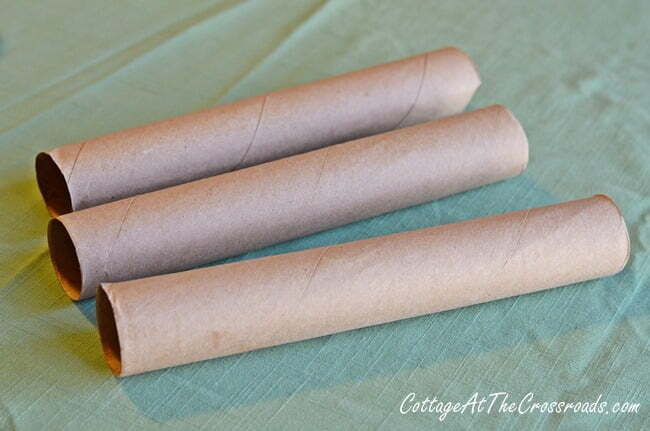 First, you will need some paper towel (or toilet paper) rolls. I used 3 because I had to experiment a bit to get the right size. 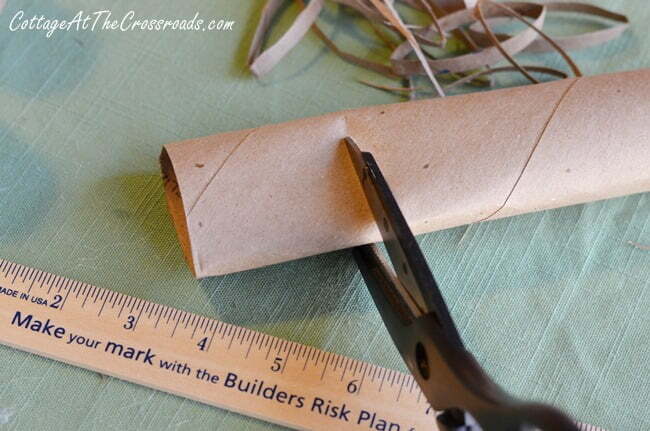 Cut the roll into 2 inch long pieces. I cut 8 pieces since I needed 8 napkin rings. 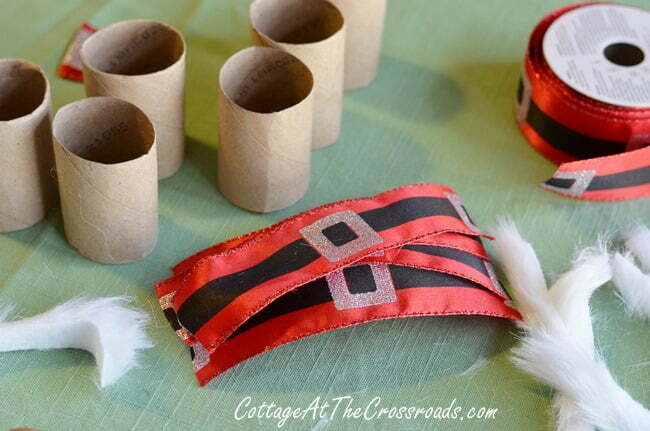 You will need some ribbon that looks like Santa’s belt. I found mine at Walmart, and the width of the ribbon is 1/2 inch. 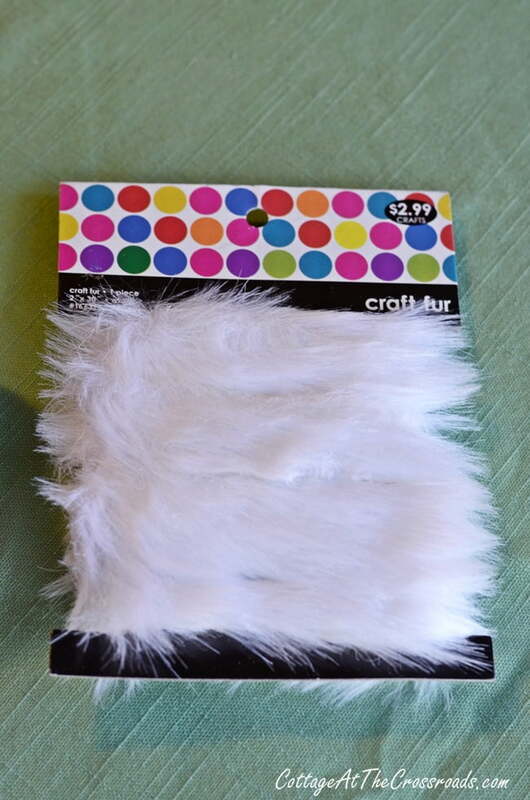 You will also need some craft fur to edge the napkin rings. This came from Hobby Lobby. 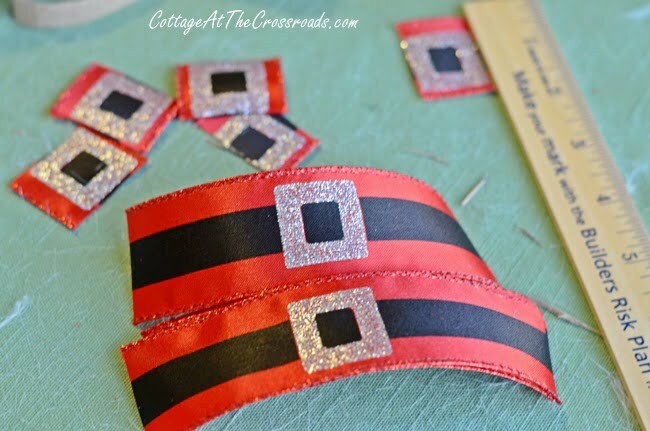 Next, you will need to cut 8 pieces of ribbon to fit around the rolls. Each ribbon piece that I cut was 6 1/4 inches long. I did find that I had to be careful about cutting the ribbon so that the black part would match up on the back. You can see some buckles that had to be snipped off! 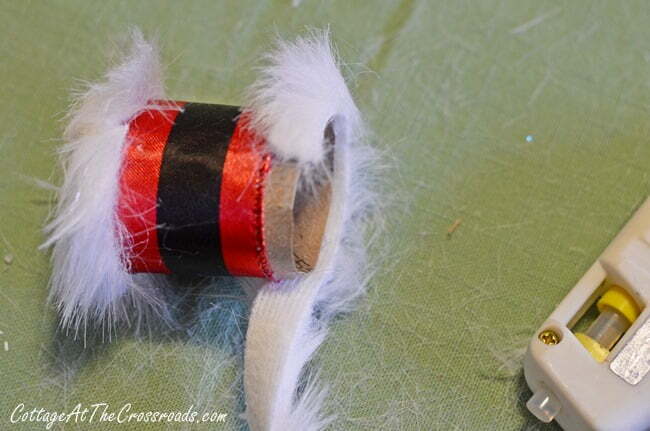 I used hot glue to attach the ribbon to the roll. 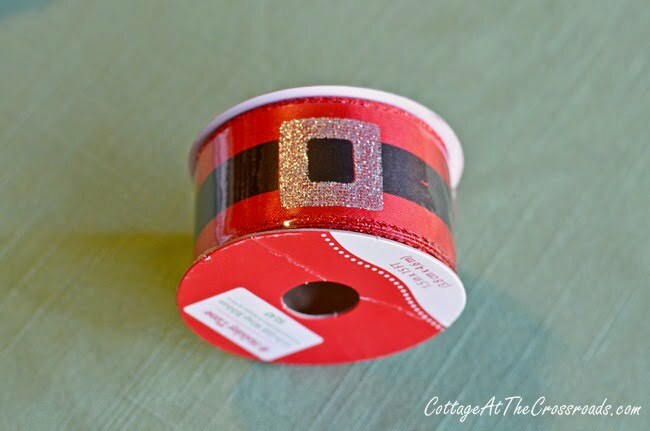 In this photo, you can see how much of the roll is showing above and below the ribbon. I actually found that you only need about 1/4 inch on the top and bottom. Since this was the first one that I did, I left more than that but I ended up shortening the roll. Cut the fur into strips that are 1/2 inch wide. I will warn you that this project gets messy at this point because when you cut the fur strips, it sheds worse than our dog, Lucy! And that’s saying a lot! Attach the fur strips with hot glue, leaving about 1/4 inch hanging over the edge. I didn’t leave any hanging over the edge in the first one I made, but I think it looks better to turn some fur over the edge so that you don’t see the cardboard roll on the end. Here is one on a napkin that I’m planning on using. 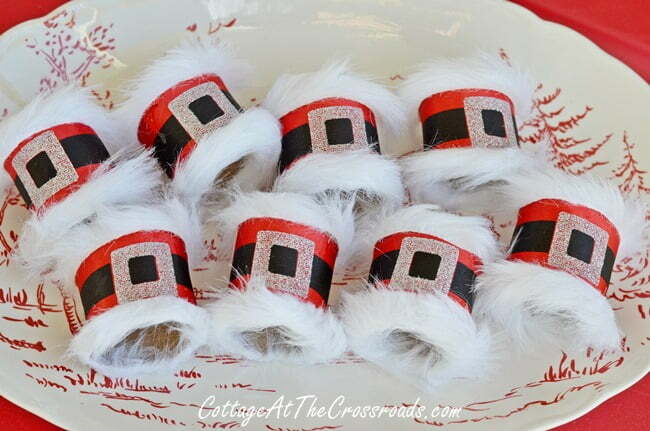 Now you see why I needed the Santa napkin rings! I think they are as cute as those pricey ones I saw in the store! I love these! I’ve been making my own napkin rings for a couple of years and it’s so much more fun than just buying them ready made! 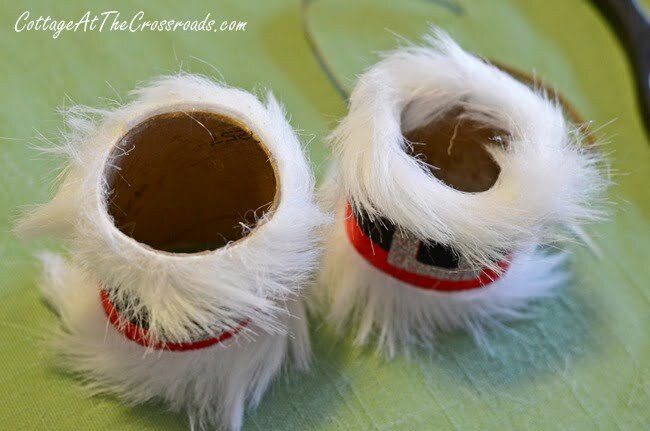 These are adorable – sure hope I can find the ribbon and fur! What a wonderful idea !! I plan on doing something different this season— and this is perfect !!! Thank you so very much ! I wish you and yours a very Merry Holiday Season !! God Bless. Way ya go….beautiful.. you are good. Going to do these for my family. Thanks for showing them. Adorable, you did a great job on recreating them, if I had seen these for sale I would have bought them right away. such a cute idea…..suggestion, turn the fur over so the fur is underneath, cut it. The fur will not shed near as much………………..from an old crafter! Thanks so much, Linda! I had no idea! So creative and cute as can be. They look fantastic! Thanks so much for sharing this DIY great idea! Just adorable. I am going to look for that ribbon today. 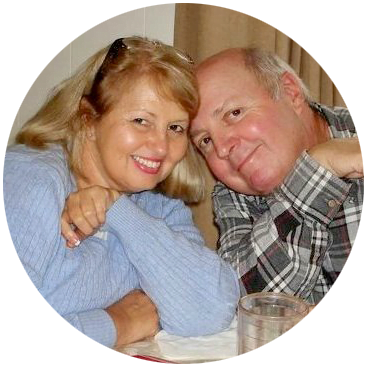 Great project for my sweet DIL and me. How cute! 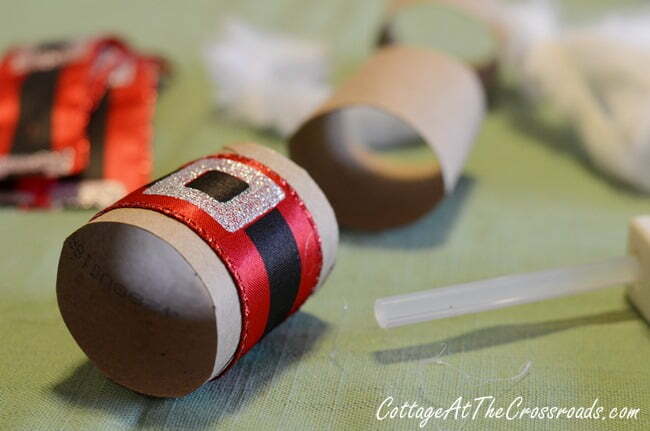 The things you can do with a paper tube! They are too cute and the right price! omg Jane, these are too cute, LOVE that ribbon! Jane these are super cute!!! Good grief, how adorable are those! Love them! Oh my goodness Jane, these are darling!! This is a great idea and very clever of you to make some of your own instead of buying the pricey ones. 🙂 I just love these!! Thanks for sharing — I’m going to pin them right now. Visiting from Met Monday — have a great day! How cute! I like to use napkin rings for the holidays. I’d love it if you shared these at Holiday Best at Tumbleweed Contessa. Have a great week. Genius! Thx for sharing your creativity with us! I too, wouldn’t have paid $48 for the napkin rings, but never would’ve come up with this brilliant and adorable idea! Those are perfect Jane, what a great find. I have never seen ribbon like that and the fur is the perfect touch. Super cute idea! I will have to see if I can find the ribbon at Walmart this week. Thanks for the inspiration! I think they are great! I will have to see if I can find the fur and ribbon, the paper towel roll I have! 🙂 Great job! Those are the cutest and good for you making your own! Jane ~ These are beyond adorable and festive!! What an ingenious idea. I think they are absolutely beautiful! Great job. Oh my goodness! You should be quite proud of yourself! They look fantastic and you are so clever to figure out how to make them on your own. Fabulous!! !